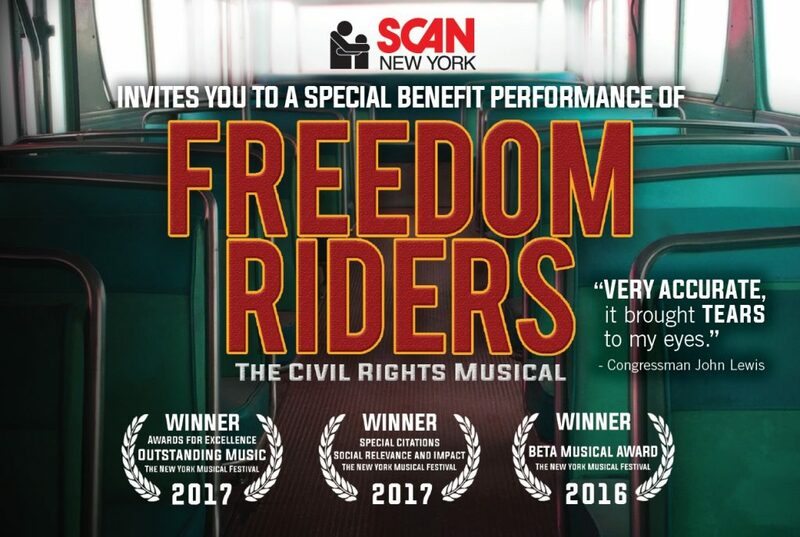 This spring we are honored to present a special Benefit Performance of the 2017 New York Musical Festival award-winning show Freedom Riders: The Civil Rights Musical. The musical tells the true story of the 1960s activists who boldly challenged the legality and optics of the Jim Crow South by riding in racially mixed groups. SCAN’s Executive Director, Lew Zuchman, is one of these original Freedom Riders, and so we are excited and proud to have this performance as the center of our benefit event. In addition to the show — which will include over a dozen extraordinarily talented performers, a live band, and video projections — we also invite you to attend a post-performance panel discussion that will feature original Freedom Riders, as well as cast members from the show, and the creators of the musical. We invite you to generously support our benefit event, and help SCAN raise the funds needed to improve the lives of the most vulnerable children and families in the communities we serve.